Autochrome is an additive color 'screen-plate' process: the medium contains a glass plate, overlaying random mosaic of microscopic grains of potato starch, with lampblack filling the space between grains, and an impermeable black-and-white, panchromatic silver halide emulsion. The grains are a mixture of those dyed orange, green and violet, which act as color filters.The plate is processed as a slide— that is, the plate is first developed to a negative image and then reversed to a positive image — and the starch grains remain in alignment with the emulsion after processing in order to allow the colors to be seen properly. To create the Autochrome plates, a slightly concave glass plate was coated with a mixture of pitch (crude pine sap), and beeswax. The starch grains, graded to between 5 and 10 micrometres in size, were coated on top of the plate. The exact methods by which they were coated still remain unclear, although it is known that approximately four million grains per square inch coated the filter in a single layer. It was later discovered that applying extreme pressure to the plate — around 5,00 kg/cm² — would improve the quality of the image, as the starch grains would be flattened slightly, reducing graininess and transmitting more light to the emulsion. Lampblack was then applied by a machine in order to fill the clear spaces between the grains. After this, the plate was coated with shellac. This served to protect the color mosaic and provided a flat surface for the emulsion, which was spread on the plate once the shellac dried. The individual grains give Autochrome photos a pointillistic effect, rather like a Seurat. If you click to enlarge the postcard, you can pick out individual grains. 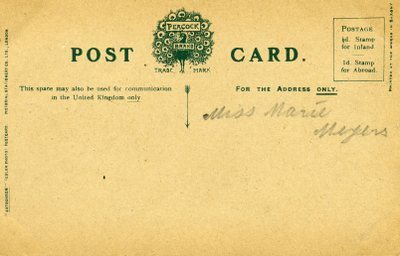 The writing on the postcard says, "Miss Marie Meyers." That was my mother's mother's maiden name. She was born in 1892 and married when she was about sixteen, so that would date the postcard to 1910 at the latest. 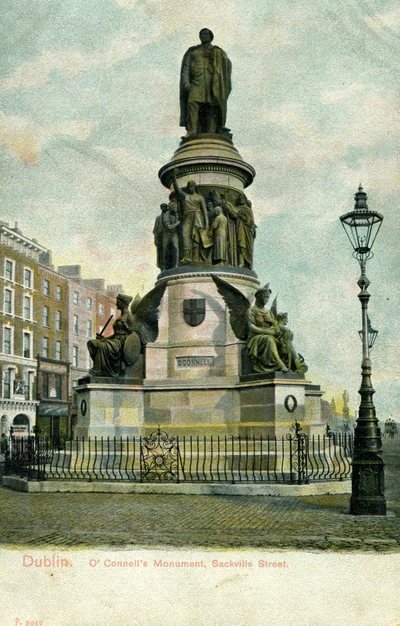 The monument itself still stands in Dublin and memorializes Daniel O'Connell, the Liberator, (1775-1847). OConnell is "remembered in Ireland as the founder of a non-violent form of Irish nationalism, and for the channelling of Irish politics by the mobilisation of the Catholic community as a political force, with the help of the clergy." Fantastic - and even a rare early example of color photography - on a postcard - will wonders ever cease?